Element 6 - Carbon - Science Notes and Projects." Science Notes and Projects. Wordpress, 31 May 2013. Web. 22 Jan. 2015. In 1772, Antoine Lavoisier showed that diamonds are a form of Carbon. He burned carefully weighted diamond and carbon Samples and showed that both substances produced no water Vapor and the same amount of carbon dioxide gas per gram. Graphite was thought to be a form of lead until 1779, when Carl Wilhelm Scheele showed that the graphite was a charcoal, but with a small mixture of iron. Carbon is the 4th most abundant element in the universe. It is a nonmetal that has two main forms, diamond; the hardest substance in the world, and graphite, the lead in pencils that is pure carbon. Organic chemistry is carbons compounds. All organic compounds contain carbon; some compounds of carbon that are not classiﬁed as organic. Organic compounds are compounds of carbon that usually contain hydrogen, and that may also contain other elements such as oxygen, nitrogen, sulfur, and phosphorus. Amorphous carbons are formed when a material containing carbon is burned without enough oxygen for it to burn completely. The black soot is known as lampblack; it is used to make inks, paints and rubber products. It can also be pressed to form the cores of driest cell batteries. Diamonds, an occurring form of carbon; it is one of the hardest substances known. Typically used for jewelry, but other good uses of diamonds are produced. Diﬀerent diamonds are made by squeezing graphite under high temperatures and pressures for several days or weeks and are until it’s used to make things like diamond tipped saw blades. Graphite is one of the softest materials and is a form of carbon. Naturally occurring graphite occurs in two-forms, alpha and beta. Alpha type graphite and is used as a lubricant, graphite, in a form known as coke, is used in large amounts in the production of steel. Coke is made by heating soft coal in an oven without allowing oxygen to mix with it. Although commonly called lead, the black material used in pencils is graphite. in normal condition. It requires high temperature to react even with oxygen. It is the 4th most abundant element in the universe. About 20% of the weight of living things is carbon. The carbon atoms in our body were all once part of the carbon dioxide fraction of the atmosphere. Car tires are black because they are about 30% carbon black, which is added to rubber to strengthen it. The carbon black also helps protect against UV damage to the tires. Carbon faces nuclear fusion reactions in heavy stars to make neon, magnesium and oxygen. Carbon is in all living things. 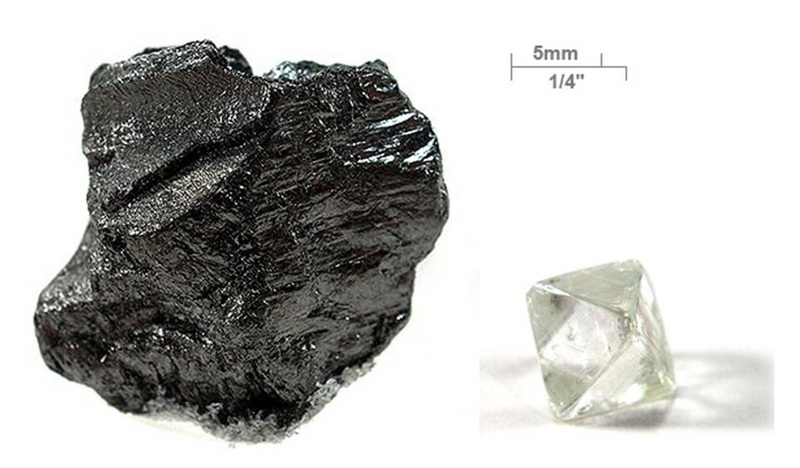 Carbon can take the form of one of the hardest substances (diamond) or one of the softest (graphite). "The Element Carbon." It's Elemental -. N.p., n.d. Web. 30 Oct. 2015. <http://education.jlab.org/itselemental/ele006.html>. "World of Carbon." Arizona State University. N.p., n.d. Web. 30 Oct. 2015. <http://invsee.asu.edu/nmodules/Carbonmod/point.html>. "Get Facts About Carbon." About.com Education. N.p., n.d. Web. 30 Oct. 2015. <http://chemistry.about.com/od/elementfacts/a/carbon.htm>. "Carbon Facts - Uses, Properties, Atom, Structure, Fiber, Graphite, Element C." Carbon Facts - Uses, Properties, Atom, Structure, Fiber, Graphite, Element C. N.p., n.d. Web. 30 Oct. 2015. <http://www.sciencekids.co.nz/sciencefacts/chemistry/carbon.html>. "Carbon Element Facts." Chemicool. N.p., n.d. Web. 30 Oct. 2015. <http://www.chemicool.com/elements/carbon.html>. Emsley, John. The Elements. Oxford: Clarendon, 1998. Print. Green, Dan. The Elements. Broadway: Scholastic, 2012. Print. Pictures: "Carbon." Wikipedia. Wikimedia Foundation, n.d. Web. 30 Oct. 2015. <https://en.wikipedia.org/wiki/Carbon>. "Carbon." ​ Science Notes. N.p., n.d. Web. 30 Oct. 2015. <​ sciencenotes.org​>.